97 min. Walt Disney Studios Distribution. Director: Jon Chu. Cast: Rick Malambri, Adam G. Sevani, Sharni Vinson, Alyson Stoner, Keith "Remedy" Stallworth. The dance movie has moved so far into cliché that it has earned its own parody movie (last year's Dance Flick), but Hollywood has continued, unabated, in churning out dance pictures. And there can be only one good reason for this: they're a good financial investment. People like 'em,and they're cheap to make. So far be it from me to stand between the people and Step Up 3D. Absurd as it is, this sequel has the added-value gimmick of limbs that burst from the screen, and though original Step Up star Channing Tatum doesn't go for a three-fer, Glee's star hoofer Harry Shum, Jr, does. And the Zoltar machine from Big makes a cameo. So there's that. Also making return appearances are Step Up's Camille (Alyson Stoner) and Step Up 2 the Streets' funny-guy Moose (Adam G. Sevani), now paired as a cutesy couple of NYU freshmen (they're meant for each other, though he doesn't know it yet). Moose finds a new hero to worship in amateur filmmaker/dance hunk Luke (Rick Malambri), who feels like he was "born from a boombox" (also the title of his magnum opus dance documentary). Impressed by Luke's sneaker collection—enough to put Imelda Marcos to shame—Moose can't resist joining the Pirates, though the intense training threatens his NYU education and his relationship with Camille. And of course Luke will discover his own love interest: joiner Natalie (Sharni Vinson) falls hard for Luke's so-soulful artiness, but she harbors a secret loyalty that will complicate their budding love. It's all cheesier than a Kraft factory, with godawful dialogue and ultra-predictable plotting (What? The dance contest is the same time as my English test? Oh, snap!). But there's a kind of camp appeal to it all. The pose-heavy dance sequences are memorably ridiculous, more likely to inspire giggles than awe. We get a waterdance, a masked tango to "Bust Your Windows," and a dance sequence whose light-up costumes imply a not-so-sublminal advertisement for TRON: Legacy. Director Jon M. Chu may not bring the noise or the funk, but he does bring what seem like outtakes from a lost post-apocalyptic cyberpunk movie: we are beyond Thunderdome here, people! Put let's not forget that Step Up 3D is, y'know, in 3D. This allows Luke and Natalie's foreplay to consist of making slushie drinks defy gravity (Chu often uses a bird's-eye view to goose the movie with 3D trickery). Okay, so Step Up 3D is incredibly stupid in just about every way. And yet, it had what may have been my favorite scene at the movies this year: a highly impressive one-take dance duet for Sevani and Stoner. Set to a remix of Fred Astaire's "I Won't Dance," the city-street sequence drifts further from reality and closer to magic, as if the golden age of movie musicals were suddenly alive and well again. Those few minutes might just make the other hundred worth it. As for those other hundred: Dance 10, Smarts 3. 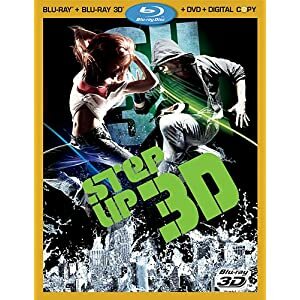 Disney capitalizes on the most salient feature of Step Up 3D with a value-packed Blu-ray + Blu-ray 3D + DVD + Digital Copy combo pack. Since the feature is one of the very few live-action titles on the market that was legitimately designed for the 3D format, most owners of 3D HDTVs will consider this early title a no-brainer to maximize enjoyment of their sets, and Disney wisely uses the combo pack set to encourage those planning on an eventual 3D HDTV upgrade to invest now, since they can enjoy in the interim the regular Blu-ray, DVD, and digital copies of the flick. Image quality is outstanding, and the 3D version is a visual delight. The dance sequences naturally provide the most pop, with flailing limbs jutting out of the screen, but director Jon M. Chu also provides appealingly dimensional photography of the New York skyline and long city blocks, and he cheekily includes '50s throwback 3D stunts like bubbles and balloons that float up toward a high-placed camera and transitional titles that seem to leap into the viewer's lap. Even though these effects may provide a heck of a lot more fun that the hackneyed story, kids of all ages will thrill to the 3D gimmickry. The transfers excel in all of the usual regards as well, with brilliant color and razor-sharp detail the high points of a clean and crystal-clear picture: even the 2D hi-def transfer creates an impressive illusion of depth. And one simply can't go wrong with the lossless DTS-HD Master Audio 7.1 sound mix: it's top of the line, with pounding beats that propel the music-filled movie. Though they may not have the broadest of appeal, the bonus features add value for fans of dance flicks. "Born From a Boombox: A Luke Katcher Film" (11:51, HD) serves up the film-within-the-film in its entirety, uninterrupted and in full widescreen. "Extra Moves" (7:20, HD) delivers dance clips trimmed from the final cut. Eight "Deleted Scenes With Intros by Director Jon M. Chu" (20:08 with "Play All" option, HD) include "Club Battle," "Sneaker Montage," "Carlos Explains Red Hook," "Jacob Tribal Story," "Capoeira," "Moose Gets 'Sick,'" "Sad Montage," and "Opening World Jam." Eight "Music Videos" (29:48 with "Play All" option, HD) comprise "Club Can't Handle Me" by Flo Rida Feat. David Guetta, "My Own Step (Theme From Step Up 3D)" by Roscoe Dash and T-Pain Feat. Fabo, "Already Taken" by Trey Songz, "This Girl" by Laza Morgan, "This Insanity" by Sophia Fresh Feat. T-Pain, "No Te Quiero (Remix)" by Sophia del Carmen Feat. Pitbull, "Irresistable" by Wisin y Yandel, and "Spirit of the Radio" by Jrandall. Also included are "Making of the Music Videos" (1080p, 7:16) and a "Sneak Peek" (1:10, HD) for Secretariat. All site content © 2000-2019 Peter Canavese. Page generated at 04/25/2019 07:40:44PM.